Wavy-leaf Silk Tassle is a familiar native species here in Southern Oregon, and because of its foliage, is a unique and pleasing ornamental specimen. These broad-leaf evergreen shrubs are dense and erect, and grow from 7 to 16 feet tall and wide. Native to coastal regions of Oregon and California, they are usually found in drier sites. They have opposite, leathery leaves that are glossy green on top, and paler and duller on the underside with characteristic wavy leaf margins. The stems are orange-green to leathery brown. These plants are dioecious, housing male and female flowers on separate plants- both have elegant, long, gray-green catkins, but the males are more showy, sometimes reaching 10 inches long! Plant these plants in full sun to part shade, although they thrive in part shade. They can tolerate moderately heavy clay soils and serpentine soils, but as long as the soil is well drained, they can adapt. 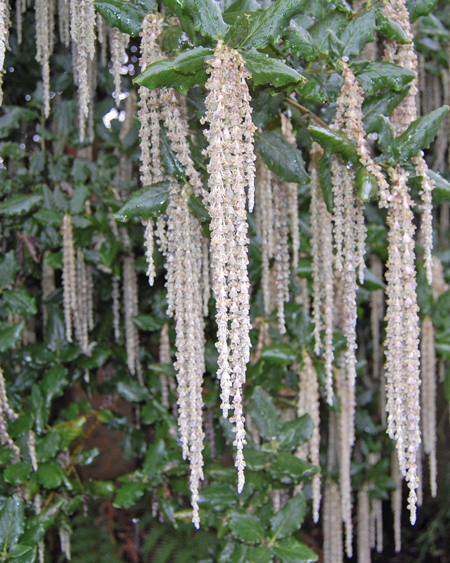 These are low-maintenance shrubs that are useful when planted growing against a wall, as a windbreak, or in a hedge. 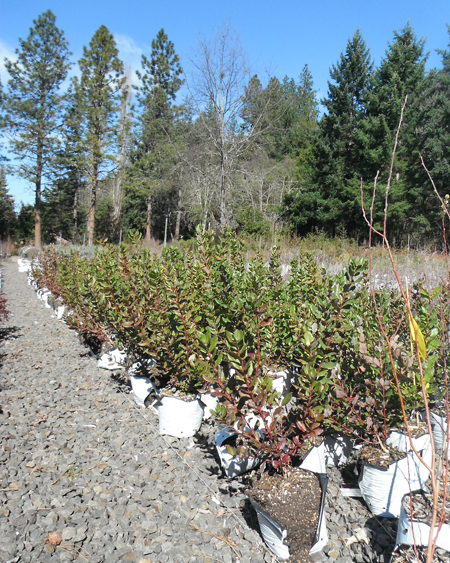 Categories: All Plants, Broadleaf Evergreens, Native Plants, Restoration Stock, More..